Providing you the best range of vegetable plastic baskets with effective & timely delivery. Our immense domain expertise and market knowledge assist us manufacture and supply a finest quality array of Vegetable Plastic Baskets that is largely demanded in agricultural industry. The offered Plastic Vegetable Crate is best suited to carry agricultural products like onion, peanut, garlic and various other products. 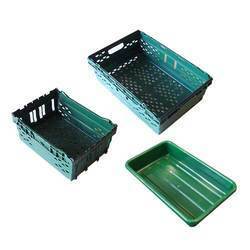 Manufactured by skilled professional using latest techniques and the finest grade raw material, this Plastic Vegetable Crate is tested on certain parameters to ensure its durability. We Mph Group are offering this Vegetable Plastic Baskets in different specifications at most affordable price to our clients.